Students on the Blue 7 Team at Manor Middle School learned firsthand about the voting process. Early in November, any student interested in running for president announced their candidacy. Each of the 27 candidates campaigned within their sections preparing a platform based on relevant middle school issues and naming a vice president and treasurer to help with their campaign. A primary election was held and a candidate from each of the five sections advanced to the final election. On November 13, all five candidates held a mock debate in front of the Blue 7 Team. Using powerpoint programs, the candidates outlined their plans and made their campaign promises. All candidates supported more time between classes and rotating the lunch schedule. Candidate Cade Braas also supported being able to carry a water bottle to classes. Emily Cummings campaigned for a student lounge and more pep rallies. Jonathan Flatley wanted to see middle school hours changed to 8:30am to 3:00pm and more club options. Vinny Vozzella was for more middle school sports teams and early dismissals every 3rd Friday. Trey Erisman felt there should be more privacy to change in the locker rooms and supported teachers coordinating homework assignments. The election was held later that week and Vinny Vozzella was elected President of the Blue 7 Team. 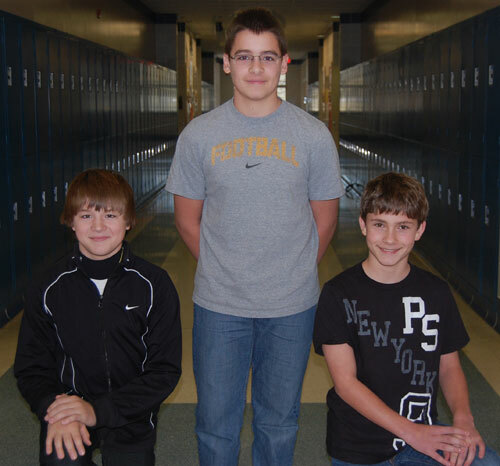 He is pictured (center) with his vice president, Ben Wright (left) and his treasurer, Martin Zavadan (right).